Taiko Returns this week; Sept/Oct’s world of music – right in Claremont! 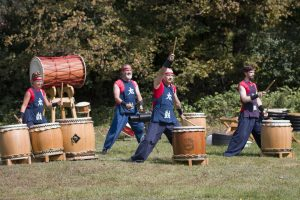 Join us in the field at Union Church for our Annual Japanese Taiko Drumming performance! This year will feature participants in the taiko drumming workshops, and a performance by a Burlington Taiko Group Trio. You won’t want to miss this annual event. Admission for this event is by freewill donation, suggested at $15 for Adults and $25 for families, or pay what you can. WCCMA is committed to making music and art accessible to everyone in our community, and so we invite you to attend regardless of financial situation. Burlington Taiko Drumming Residency September 19 – 21 @ CSB Community Center Learn to play the taiko drum in this fun and informative multi-day workshop. Afternoon Workshop: Wednesday – Thursday 3:00pm – 4:30pm. Evening Workshop: Wednesday and Friday at 6:00 – 8:00pm. Freewill suggested donation $25. Friday 5pm rehearsal for all drummers who plan to participate in the performance. For information about the Taiko Drumming Workshops held Sept 19-21 please contact melissa@wcc-ma.org. World dance at its best! 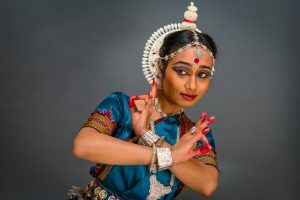 Assisted by her students, professional performer and educator Mouli Pal introduces the grace and intricacy of classical Indian dances like Bharatanatyam and Odissi. These ancient dance forms are infused with moods and emotions inspired by stories, songs and art from India. Audience members will have the chance to learn and try some simple movement. Programmed in conjunction with Ragamala Dance Company “Written in Water” performing at the Hop on Sep 18 & 19. These free performances are designed to entertain and introduce children ages 3 and up to the world of dance, music, theater and storytelling. The performances are participatory, so come ready to sing, dance and clap along—and bring the whole family! 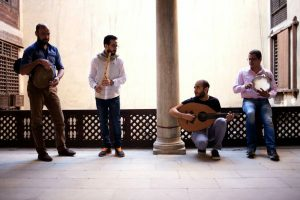 With his group, Karkadé, Mohamed Abozekry fuses Egypt’s popular and classical music traditions with virtuosity and mystique. This performance is a part of WCCMA’s fall season of live performances and education, we are committed to barriers free access to great music. Admission is by freewill donation. For this concert we suggest a donation of $20 Adults, $30 for families, or “pay what you can.” For more information visit wcc-ma.org. Mohamed Abozekry has that rare gift of combining limitless virtuosity with an unbridled imagination. An oud master still in his mid-twenties, Abozerky’s ambitions – to musically interpret the world around him and de-exoticize his instrument – mark him as a polymath of forms. “I never move backwards, but in a circular motion and return to the place I started with more experience.” With Karkadé, Abozekry evokes the hibiscus tea found everywhere in Cairo, and the eponymous French café at which this project was born. He convenes Egypt’s popular and classical music traditions, her Sufi calls, and secular poetry, to musically describe a path to an Arab world at peace with its history and turned towards the future. Abozekry “has a stunning command of his instrument, as well as an open ear for other forms.” (PASTE MAGAZINE) The presentation of Mohamed Abozekry & Karkadé is part of Center Stage, a public diplomacy initiative of the U.S. Department of State’s Bureau of Educational and Cultural Affairs, administered by the New England Foundation for the Arts in cooperation with the U.S. Regional Arts Organizations, with support from the Doris Duke Foundation for Islamic Art, and the Trust for Mutual Understanding. General management is provided by Lisa Booth Management, Inc. This performance is a part of WCCMA’s fall season of live performances and education, we are committed to barriers free access to great music. Admission is by freewill donation. For this concert we suggest a donation of $20 Adults, $30 for families, or “pay what you can.” For more information visit wcc-ma.org. Youssra El Hawary’s socially-aware, personal, and original music innovates as much in content as it does in style. In the half-decade since she became a slyly defiant sensation in the aftermath of the Egyptian revolution, El Hawary continues to be a bellwether of everyday life. 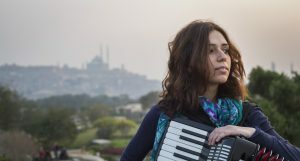 With charismatic charm, her lithe compositions capture the stories of Cairo, and the charged alchemy of the Mediterranean basin that fuels her distinctive and soulful sound. “Perfect, easy magic. I’m totally hooked on music by this folkie-ish, indie-ish, chanson-ish singer/songwriter from Egypt armed not with a guitar, but … an accordion.” (NPR’s All Songs Considered) The presentation of Youssra El Hawary is part of Center Stage, a public diplomacy initiative of the U.S. Department of State’s Bureau of Educational and Cultural Affairs, administered by the New England Foundation for the Arts in cooperation with the U.S. Regional Arts Organizations, with support from the Doris Duke Foundation for Islamic Art, and the Trust for Mutual Understanding. General management is provided by Lisa Booth Management, Inc. The Dinuk Wijeratne Trio performs globally-inspired music effortlessly blending Classical, World, and Jazz. 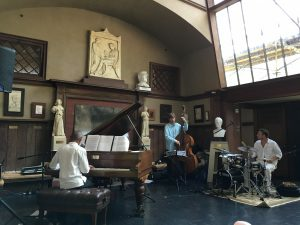 Compositions by Dinuk Wijeratne for piano, upright bass, and percussion. This performance is a part of the Bach Tree Residency program, and is funded in part by a donation from the Byrne Foundation, and by the Expeditions program of the New England Foundation for the Arts, made possible with funding from the National Endowment for the Arts, with additional support from the six New England state arts agencies. WCCMA is committed to barriers free access to great music. Admission is by donation, the suggested freewill contribution is $20 for Adults, $30 for Families, or pay what you can. For more information about WCCMA visit wcc-ma.org. Step far beyond the musical page to develop your creative and collaborative skills and amplify your craft. work with internationally acclaimed and well-travelled musicians Dinuk Wijeratne and Nick Halley. An intensive workshop using the extraordinary Bach Canons as a foundation for performance, composition and improvisation, with an aim to broaden the skill set and imaginations of all participants. October 13 and 14 Workshops Sessions and Showcase. Participates will be placed in groups based on their topic interests and availability. For more information on this very special workshops, visit: wcc-ma.org/bachtree. This entry was posted in Community Fun, Events, Music, News, Taiko, Uncategorized, Workshop, Youth Arts Enrichment Initiative by melissa. Bookmark the permalink.